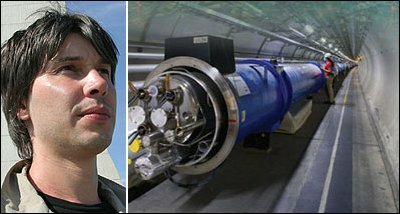 Professor Brian Cox is one of the LHC scientists at Cern. He answered some of your questions about the project and what it could find out. Q: Why experiment at all? A: Experiment is the basis of the scientific method, without which there would be no modern world as we know it. The quest to understand the smallest building blocks of nature and the forces that hold them together arguably began with the ancient Greeks, but it was only when we began to conduct experiments that we discovered the electron (1897), quantum mechanics (triggered by precision observations of the light emitted by elements when heated), X-rays, the atomic nucleus, radioactive decay... the list is practically endless. Without these experimental discoveries, and the subsequent deepening of our understanding of the Universe, there would be no electronics, no silicon chips or transistors, no medical imaging technology, no nuclear power stations, no X-rays or chemotherapy treatments for cancer... again an almost endless list. What this should teach us is two things. First, it is virtually impossible to deepen our understanding of Nature without experiments. Second, understanding Nature has never been a bad idea - indeed without the pioneers of the past century, our civilisation would be immeasurably poorer. A: The LHC could indeed provide strong evidence for the existence of extra dimensions in our Universe. The fact that they are so hard to see (if they exist), however, means that our world interacts with them very weakly. Will the LHC help our understanding of dark matter (which seems to make up most of the Universe) and "dark energy" (which seems to be accelerating the expansion of the Universe)? A: Quite possibly, yes, certainly for the case of dark matter. One of the most popular interpretations of the evidence that points to the existence of dark matter is that there are new, as yet undiscovered heavy particles, in the Universe that interact with normal matter only via the weak nuclear force and gravity. In particle physics, we have a family of theoretical candidates for such particles known as Supersymmetric particles. If these exist, then many theoretical physicists expect them to be made and discovered at the LHC. Dark energy is another mater, because we have very little theoretical understanding of this phenomenon at present. A: If you're asking about the mini-big bangs at the LHC, then the chances are zero. It's a bit of a misnomer actually to call the collisions mini-Big Bangs - each one has the energy of a mosquito hitting you in the face on a summer's day, albeit confined to a very small space! But - and this has little to do with the LHC directly - some of the current theories of the origin of our Universe suggest that in fact the Universe has been around for ever. What we see as the Big Bang was simply something happening to our little piece of space-time 13.7 billion years ago. There could be multiple "sheets" of space-time (sometimes called "branes" floating around in an infinitely large multi-dimensional Universe, with everything we see being confined to just one). A: It's just possible that we could create mini-black holes, although this would require at least that there are extra dimensions in our Universe, for which we have no evidence! If, however, we did, then the little black holes would bear no relation at all to the black holes created when stars collapse. They would evaporate away very quickly via a process called Hawking radiation (unless we have no understanding at all of quantum theory). A: I wish I knew! Let me give one positive example from history. Quantum mechanics was developed to maturity as a theory during the 1920s and by 1947 we had the first transistor. It is often said, I think with some justification, that it is extremely unlikely that transistors could have been developed without the quantum theory. Q: New forms of fuel? A: No energy comes out of the LHC - we get out of every collision exactly what we put in. I think the best hope for LHC technology helping us with the energy crisis is that the cooling systems developed for LHC are now being transferred to the ITER fusion project in France. Q: What if the Higgs boson particle is found? A: The Higgs particle is one of our theoretical explanations for the origin of mass in the Universe. If found, therefore, we will understand what mass is! This is the place where we are "stuck" at the moment in our theories, and answering this question will, we suspect, provide a door to a deeper understanding of the Universe. Q: What if there is no Higgs boson? The overwhelmingly most likely explanation for our continued existence in the face of this potentially prolific production of black holes is that they aren't produced at all because there are either no extra dimensions in the Universe, or they aren't set up right for us to see them. In other words, they evaporate away very quickly indeed. This process, which is perhaps Steven Hawking's greatest contribution to theoretical physics, is on significantly firmer theoretical ground than the extra dimensions theories required to create the little black holes in the first place. And even if you don't buy any of this, then you can still relax in the knowledge that we have no evidence anywhere in the Universe of a little black hole eating anything - not just Earth but the Sun and planets and every star we can see in the sky, including the immensely dense neutron stars and white dwarfs, remnants of ancient Suns that populate the sky in their millions and which because of their density would make great black hole food. So - the only theoretical bit is in the proposition that you can make little black holes in the first place. From then on, observation tells us that these things either (a) don't exist - the most likely explanation; or (b) exist, but do not eat neutron stars and are therefore harmless, probably because they evaporate away very quickly indeed!